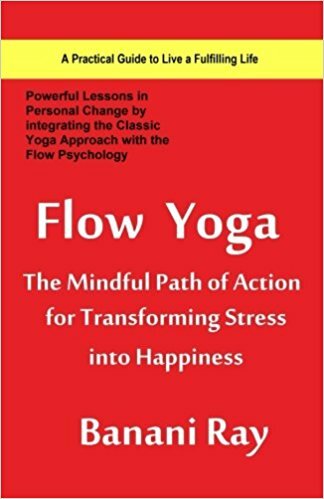 Flow yoga is a guide book to physical and emotional health and happiness backed by modern flow psychology and ancient yoga wisdom, which may set your life back on track. Flow yoga will allow you to live a better life by allowing you to appreciate the power of flow in your daily life. The flow state is associated with happiness. It is basically about allowing attention to be focused and erasing psychic imprints from your mind and start afresh again, living life to the fullest without any unwanted thoughts distracting the mind. We all are capable of reaching that state of effortless concentration and enjoyment called “flow” by performing an activity fully immersed in a feeling of energized focus, full involvement, and enjoyment in the process of the activity. In this book Banani Ray has explored the possibility and shares her experience about the practice of consciously inducing Flow in our lives, which she calls ‘Flow Yoga’. The book has the potential to transform the readers from both outside and inside. Flow yoga can transform you from a person seeking for answers from the outside into an individual who is able to identify emotional turmoil, and solve them within. Banani Ray shares her life’s wisdom in an easy-to-understand guide which puts the mind at calm and spontaneous happiness. The book invites you to take the journey of flow yoga, which is very liberating and empowering.